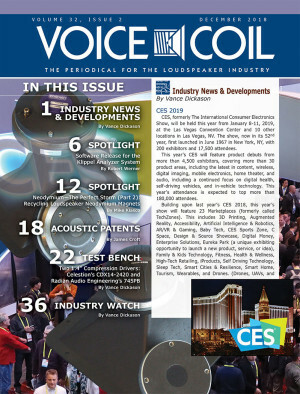 In this last issue for 2018, in Industry News & Developments, Vance Dickason tells you what any loudspeaker industry professional needs to know about the forthcoming CES 2019 show and how to get the best out of the massive Las Vegas, NV, event, especially now that there isn't any ALMA Symposium prior to the show... CES 2019 will be held this year from January 8-11, 2019 at the Las Vegas Convention Center and 10 other locations in Las Vegas. Get ready! And in Spotlight, we have another great article by Robert Werner (Klippel, GmbH), telling us everything we need to know about the latest software release for the Klippel Analyzer System. 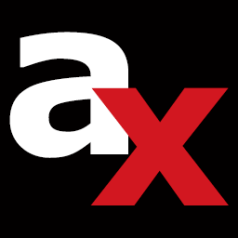 As he writes, "In modern audio system manufacturing, research and development (R&D) should be closely connected to quality control (QC) in pre-production and end-of-line (EOL) testing for optimal product performance, maximum yield, and lasting customer satisfaction." For this reason Klippel created a new unified release of the dB-Lab framework software that benefits from the latest modular Klippel Analyzer 3 hardware, which can be tailored to the particular requirement of the application while supporting the full range of software modules and hardware extension cards. 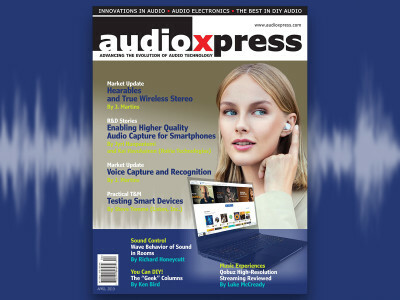 Mandatory reading for anyone involved in audio measurements, product design, and production management. And in our second Spotlight for this month, Mike Klasco (Menlo Scientific) continues his report on Neodymium — The Perfect Storm (Part 2): Recycling Loudspeaker Neodymium Magnets. In the first article, Klasco discussed the implications for the loudspeaker industry of the scarcity of neodymium suppliers outside the US and the Chinese influence on the supply chain for rare earth ores and how that might have strategic implications if the trade war continues to escalate. In this new article, he explains how recycling neodymium magnet harvested from equipment at the end of their life cycle could be soon a very important resource for speaker manufacturers, and also an important business opportunity. Of course, there are challenges you need to know. Read on. 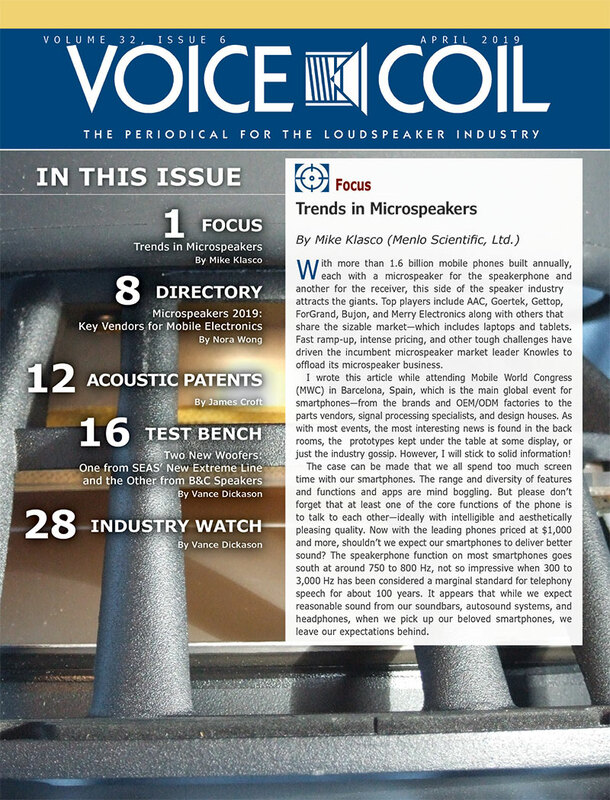 In our Acoustic Patents column, James Croft (Croft Acoustical) revisits an Acoustic Passive Radiator Rocking Mode Reducing patent awarded to Bose in 2009. 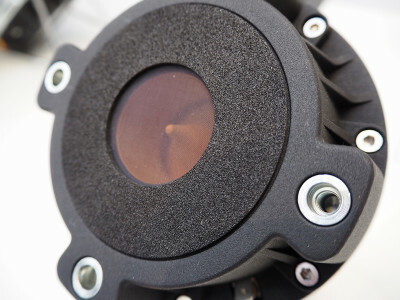 With the increasing popularity of miniaturized systems, the application of the passive diaphragm radiator, as the acoustic mass component in a bass reflex enclosure, is becoming standard practice in the low-frequency portion of the system. And these systems have a few parameter demands that can exceed the capability of many conventional approaches to passive radiator design. In order to solve those challenges, Bose proposed an effective design, using a new suspension system, which while already tested and tried in standard transducers, was never before implemented in a passive system. And it works. Read the article to better understand. 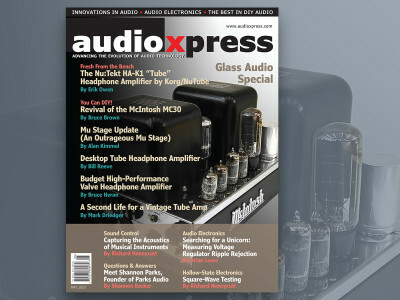 In this month's Test Bench, Vance Dickason characterized two different 1.4” compression drivers: the CDX14-2420 from Celestion and the 745PB from Radian Audio Engineering. The CDX14-2420 from legendary UK Pro Sound OEM manufacturer Celestion, joins the CDX family of neodymium motor compression drivers, now totaling 12 models (and the Celestion ferrite line of compression drivers has grown to 16 models). 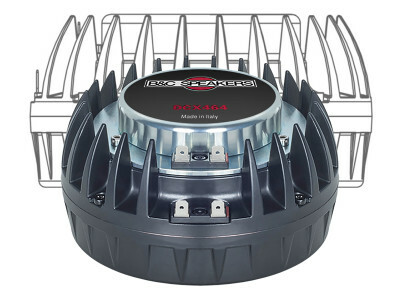 Designed for use with 1.4” throat horns, the CDX14- 2420 has a 35.6 mm (1.4”) throat diameter driven by a 60 mm (2.4”) diameter voice coil wound with edgewound copper-clad aluminum wire (CCAW) on a high-temperature fiberglass non-conducting former, which drives a deep-drawn titanium diaphragm and polyimide surround. 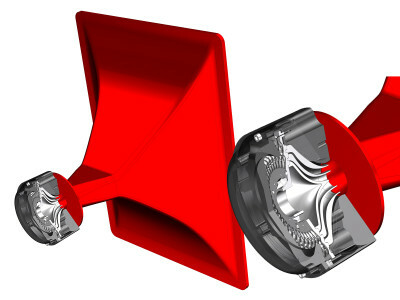 Other features include a FEA-optimized neodymium magnet motor structure, a continuous power handling of 140 W (3 dB greater than the 70 W AES rating), a 1.2 kHz recommended crossover frequency, and 1 W/1 m 106.5 dB sensitivity (measured 2 π on a typical horn). The CDX14-2420 was measured with a B&C Speakers ME90 80° × 60° constant directivity cast aluminum horn with a 900 Hz cutoff frequency. The second driver, from Radian Audio Engineering, is a ferrite 1.4” aluminum diaphragm compression driver from Radian, the 745PB. As with other Radian compression drivers, the 745PB has a rich feature set, starting with a 165 mm × 19 mm ferrite magnet motor, high-temperature 76.2 mm (3”) diameter polyimide voice coil former wound with a copper-clad aluminum edgewound ribbon wire voice coil, 75 W continuous power handing (150 W program power handing), a self-aligning field-replaceable diaphragm assembly, and the most important feature — a proprietary processed and hardened aerospace-grade aluminum alloy diaphragm over a three-slit phase plug. Finally, in this month's Industry Watch there's a wealth of news and references, starting with a piece on the 2018 Consumer Technology (CT) Hall of Fame honorees, which include John Briesch, the Sony executive who led the launch of the compact disc (CD); Dr. John Cioffi, the father of Digital Subscriber Line (DSL); Robert Cole, founder of World Wide Stereo; Richard Doherty, an influential technology journalist and industry analyst; Peter Lesser, smart home pioneer and founder of X-10 USA; Mike Romagnolo, founder of DOW Stereo/Video; and Edgar Villchur, inventor of the acoustic suspension speaker and independent suspension turntable and co-founder of Acoustic Research. 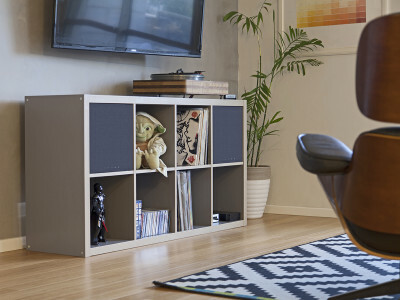 Dickason also expands on the work and contributions of Jim Thiel and Kathy Gornick, co-founders of Thiel Audio. All this and much more, not to be missed in Voice CoilDecember 2018. 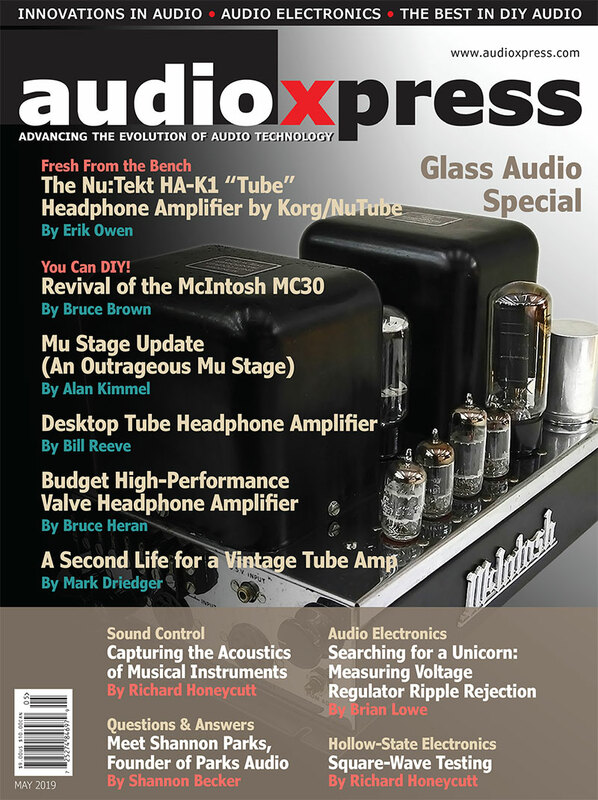 This edition is available for download and already on the mail for print subscribers. 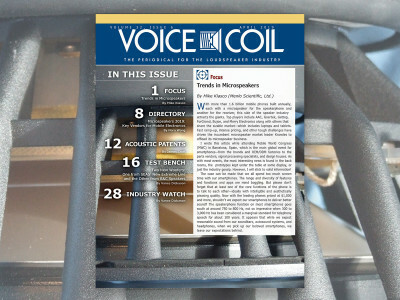 Subscribers can just go to - www.gotomyvcoil.com - to download this issue. 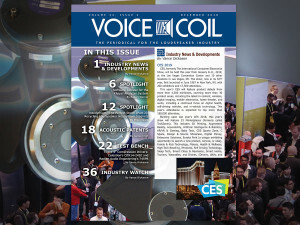 Remember, Voice Coilis available in print and download for all registered subscribers, free for industry professionals. 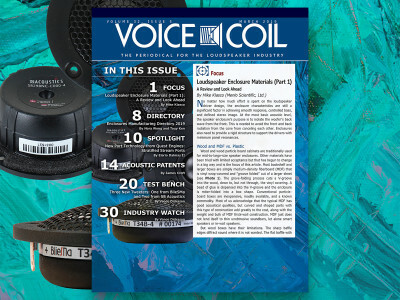 To qualify for a free subscription to Voice Coil, or renew your subscription, go to: audioxpress.com/page/Voice-Coil-Subscriber-Services.html.